Thank you, God, for coffee! Almost a week ago my doctor challenged me to prove a plant-based diet would benefit this stinking kidney disease. So, I am on it. Fortunately, I enjoy cooking for the most part. I even enjoy the prepping, thankfully. Eating plant-based is a bunch of peeling, chopping, slicing, and such. I don’t mind it. Sometimes a drive through or take out sounds great, but overall I am good with it. This week I have made a crazy good lentil soup, mashed cauliflower, lentil pasta with marinara, stir fry, pasta primavera, hearty and healthy salads, brussels sprouts salad, and sweet potato with yummy beans, raw veggies, and blueberries on the side. But what I’m REALLY good with is the lovely truth that coffee is plant-based. It grows from dirt! How lovely is that? And, as a matter of fact, so do cocoa beans. I have become quite addicted to Dunkin Donuts’ iced coffee. First, their coffee is delicious. Fourth, I treated myself to a refill cup so my drive thrus are cheap! Fifth, do I really need a fifth?? And I love this little sign on my way out of the drive through. I feel like they are talking just to me. 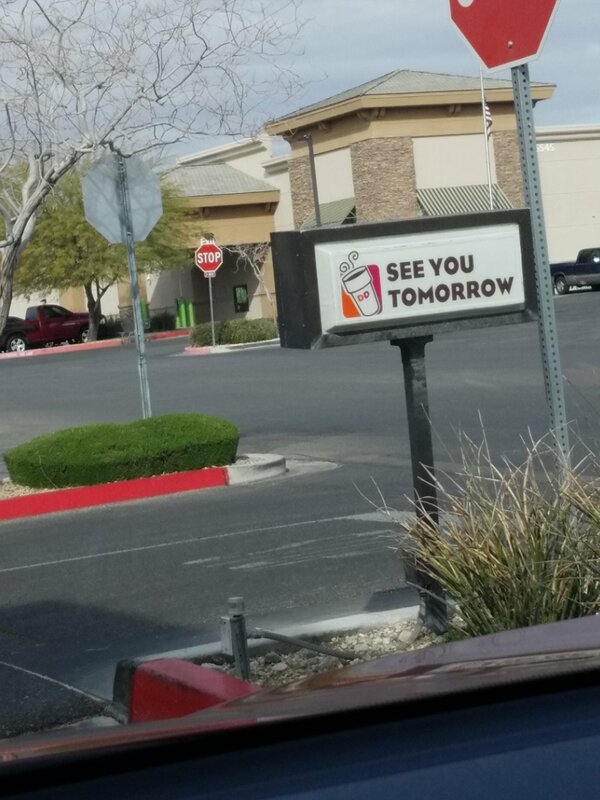 And I say, OK DD, I WILL SEE YOU TOMORROW! And, quite often I do. If you are trying to be kind to your kidney, I would try to keep my meals simple. Maybe you are doing that, but you listed some fancy dishes! At some point, you may have to do the dreaded test to see if you would be better off without coffee….sorry….